Many patients who have used medical marijuana to help combat insomnia have stated that compared to over the counter (or prescription) sleep aids, cannabis works better, is not addictive and has few side effects when they wake up. There are approximately 40% of people in North America who suffer from some level of insomnia on a regular basis. Studies have shown that the cannabinoid CBD helps insomniacs more than THC does. There is one strain of medical marijuana that seems to be the most beneficial in treating insomnia. Insomnia can become a chronic condition and it affects people all over the world. Just about everyone will suffer through an insomnia type episode at some point in his or her adult life. It can also be a symptom of an illness, stress, heart problems, and depression. There are three basic types of insomnia. Each type is defined by how long the insomnia lasts. Mild insomnia is usually a couple days long and generally takes care of itself. Moderate insomnia can last up to a month and chronic insomnia can last for months. Medical marijuana might be a good option for insomnia and sleeping problems. Consult with medical marijuana doctor before treatment. Mild insomnia can be irritating but is not a serious health issue. Moderate insomnia can become worrisome, however it can usually resolve itself and medical treatment is not usually required. Chronic insomnia can become a serious health issue. We all need sleep to give our brains time to rest and our bodies time to rejuvenate for the next day. If a person is not getting enough sleep they can start having problems with work, health and their personal lives. Most treatments are synthetically made and can be additive and leave the user with a drug hangover upon waking. There are other options that can help when dealing with insomnia like change in diet or lifestyle, however these changes do not always work alone. Medical marijuana is one of the better options for a sleep aid. A marijuana card can open a new door to overcoming insomnia. Without professional advice a person could use the wrong strain, or an incorrect amount, and make the situation worse. A medical marijuana doctor would be best in defining the level of insomnia and the type and amount of cannabis that would be best for insomnia treatment. There have been studies using a medication made from THC that has been approved by the Federal Drug Administration. This approval started with using this medication to help with nausea and other stomach problems in people being treated for cancer with chemotherapy, and showed that it was more beneficial than other anti-nausea products on the market. One of these studies targeted adults with sleep apnea. Sleep apnea is defined as a disorder when there are a number of pauses in breathing lasting as long as a couple minutes while asleep. This can happen over 30 times an hour. A person can start snoring, or making chokings sounds, experience night terrors, and even start sleepwalking. Most people who have sleep apnea wake up feeling exhausted and severe health issues can result over time. This particular study had the subjects use an approved medical marijuana medication and found a reduction of over 30% in the number of pauses between breaths in almost all of the study subjects. Medical marijuana helped most of the test subjects stay in a deeper sleep because they were not transferring from a deep to light sleep every time they woke themselves up with choking or snoring. They also found none of the test subjects experienced any side effects of the medication and awoke refreshed and alert. There have been a lot more studies about the effects of medical marijuana and insomnia and there is more information about the amount to use, the type to use and who to talk to about the use. 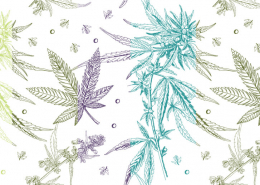 Medical marijuana doctors have access to all the latest information and study results. There are also more studies on the use of synthetic marijuana medications for people with insomnia and sleep apnea. For example, studies are showing that the treatment for mild or moderate insomnia is vastly different that that for chronic insomnia and sleep apnea. The initial responses for medical marijuana use for forms of insomnia and sleep apnea seem to be the same: people fall asleep quicker, they are more likely to sleep through the full cycle, they will fall asleep again quicker if they wake up in during their sleep cycle, they sleep longer and feel more clear headed when they wake up. However how much medical marijuana they need to achieve a restful sleep is largely dependent on how severe the disorder is. Schedule your appointment online with a licensed medical marijuana card doctor to find out if medical marijuana is the best treatment for your sleeping problems. Not only does cannabis use show to help people fall asleep faster and stay asleep longer, it also increases the amount of time a person is in the deep “regenerative” sleep cycle. Medical marijuana decreases the amount of time a person dreams, REM sleep. Many people who use cannabis don’t remember their dreams because they are not really dreaming. This side effect of using cannabis for insomnia can cause an increase in and more intensive dreams when stopping use and can last as long as a couple weeks. A lot of the side effects of most medications used for sleep disorders, including insomnia, vary from amnesia, hallucinations, sleepwalking, depression, violent responses, as well as suicidal thoughts and actions. In addition to side effects of many over the counter (or prescription) sleep aids, there is a chance of becoming addicted. General side effects of using marijuana as a sleep aid are deep sleep, few dreams and awaking rested and ready for the day. It’s very important to note that different strains of marijuana affect people in different ways, as well as how the cannabis is administered. How much THC a plant produces greatly influences how effective it is for specific issues. One marijuana strain, Indica, is considered to provide a relaxed effect that is physical. Another strain, Sativa, is higher in CBD and is thought be more effective on the brain. There are different ways of administering THC and CBD. 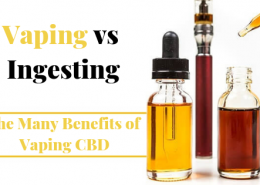 Smoking, vaporizing, ointments, and edibles are effective to varying degrees for different people. Vaporized cannabis works very fast, but ingesting marijuana can provide longer relief. Experimenting with different ways of using medical marijuana can provide a person with the most effective way of reaping the benefits. Users have found that the Sativa strains are more mood enhancing and can make falling asleep difficult. The higher level of THC can also cause anxiety issues or exacerbate other symptoms of mental illness and depression. The Indica strains are lower in THC and higher in CBD, which promotes the feeling of calm and can actually help decrease symptoms of conditions like epilepsy and some neurological disorders. There doesn’t seem to be enough information regarding the long-term physical effects of cannabis use as a sleep aid, outside of the decrease in REM sleep and dreaming rebound after stopping use. 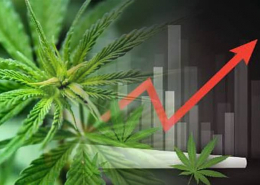 Research is ongoing and will become more prevalent as more states legalize medical marijuana, encouraging more funding to go into more intense studies. Some researchers think the use of cannabis is contributing to insomnia and insomnia sufferers should use behavioural therapies and lifestyle changes to overcome the condition. Some believe that cannabis use provides relief from the stress caused by sleep disorders and because it is a natural product, is more beneficial overall. There is no conclusive proof that cannabis use directly contributes to insomnia and other sleep disorders, but there are studies which have shown a strong connection between the amount used and the longevity of that use, and differing degrees of insomnia and other sleep disorders. There has to be more research done on both the pros and cons of smoking weed for insomnia and other sleep disorders. There also has to be more research on how women are affected by medical marijuana use for insomnia and how men are affected, how heavy users are affected and how casual users are affected. More long-term studies need to be done as well as on how biological, hormonal and societal changes can affect the use of cannabis for treating insomnia, sleep apnea and other sleep disorders. Cannabis is one of the most commonly used drugs in North America and still not enough is known about it. Users say it has helped them tremendously in dealing with sleeplessness, while some studies have suggested that the use of cannabis is a contributing factor to sleeplessness. Until more states legalize the use of medical marijuana for conditions like chronic insomnia and other sleep disorders, there will not be enough information to make conclusive, scientific determinations by doctors and patients alike. 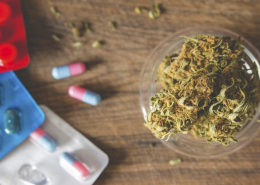 Preventing people the option of using medical marijuana for treatment may contribute more people have serious health issues due to lack of proper sleep and addictions to other sleep aids. “Growing and smoking marijuana as a sleep aid for the past eight months. I use it five nights a week. I take a couple of tablespoons of mmj in 1 to 2 tablespoons of melted butter. I put the finished product on toast, I believe this yields the best results for initiating sleep.” – P.R. Donal. T.
MMJ DOCTOR: How can I find a licensed Medical Marijuana doctor in California? How to get a medical marijuana card online? What documents do I need to get a medical marijuana card? MmjDoctor is here to help. 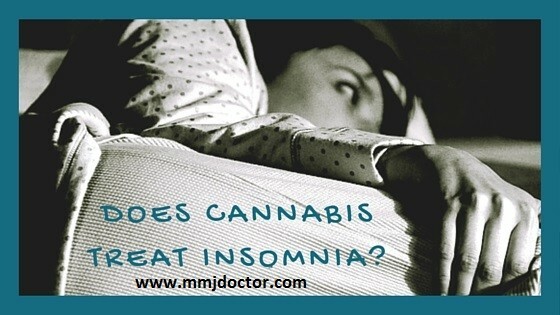 MEDICAL CANNABIS AND INSOMNIA – ALL YOU NEED TO KNOW!